Randall had always had good games against us when playing for Aldershot and was a player much admired. Just a week earlier it looked as though he'd completed a move to York City but that deal fell through. He then had the opportunity to sign for First Division Sheffield Wednesday but it was reported he'd turned that down before agreeing to a £40,000 move to Turf Moor. Randall had started his career with Bournemouth as an apprentice and progressed through to the first team where he played just three times. During his apprenticeship he won two England youth caps playing alongside Southampton's Matt Le Tissier. 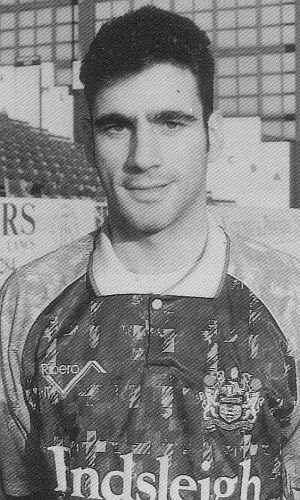 He signed for Aldershot in September 1988 and played over 100 games for them before Mullen made his move and it was a signing that he was delighted with. "He's just the sort of player we need at Turf Moor," Mullen said. "He has great vision and scores his fair share of goals from midfield. We know he gets into dangerous positions and he will be a great asset for us." Mullen confirmed that Randall would go straight into the squad for the home game against Scunthorpe United and he also spoke about the FA Cup 3rd round draw which had paired us with Second Division Derby County at Turf Moor. "It's a great draw," was the manager's reaction, before adding: "I'm very pleased because we came out of the hat first and will have home advantage, and that is very important for the players and the supporters. "The prospect of playing against Peter Shilton will be a big thrill for our forwards and the special atmosphere of a cup tie gives us a real chance of winning." Meanwhile Burnley Football Club confirmed that a minute's silence would be observed ahead of the Scunthorpe game following the death of Blackburn Rovers' chairman Bill Fox on the previous Sunday. Clarets' chairman Frank Teasdale said: "Bill will be a great loss to his club and to football in general. He had worked tremendously hard for Blackburn to get them in the position where they are at the moment. "We at Burnley have been grateful for the way he fought for clubs outside the Football League hierarchy in his position as President of the League. He always had the smaller clubs and their welfare at heart."